Peter Handscomb is set to drop down from the No 3 position to accommodate Joe Root as Yorkshire tackle Hampshire in the County Championship (Picture: Alex Whitehead/SWpix.com). ANDREW GALE will today send his Yorkshire players out on a revenge mission. The county’s first-team coach wants them to settle a score against rivals Hampshire. Yorkshire lost by four wickets to Hampshire at Headingley in the opening match of the Championship season. Now Gale wants them to avenge that result in the return fixture at the Ageas Bowl. “We were wounded by what happened against Hampshire,” said Gale, whose side bounced back with an innings win against Warwickshire last week. “We drove the vast majority of the Hampshire match. But that’s gone now, and we’ve definitely gone to Southampton to win. Gale’s confidence is boosted not only by the way that his side responded against Warwickshire, but also by the availability of England stars Joe Root and Jonny Bairstow. The duo have been granted permission by England to play having been ordered to rest for the first two rounds. “To have two guys like that, world-class players right on top of their game, it’s going to strengthen us no doubt,” said Gale. “As a result, the batting order will probably change. “We have one of the best No 3s in the world available in Rooty, so I doubt that Peter Handscomb will bat there this week. For perhaps the first and only time in the Championship this season, given the whims of England’s selection strategy, Yorkshire have their strongest top-six available for this game. 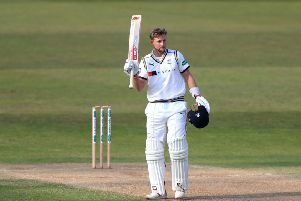 Root and Bairstow join a line-up that also includes openers Adam Lyth and Alex Lees, captain Gary Ballance, and overseas star Handscomb, who has been left out of Australia’s Champions Trophy squad in a further boost to the county’s ambitions. Jack Leaning and Andrew Hodd miss out from the team that played at Warwickshire, with Bairstow assuming the wicketkeeping gloves from Hodd. Yorkshire are still without injured pace bowlers Jack Brooks (calf), Liam Plunkett (calf) and Ryan Sidebottom (hamstring). Hampshire have injury problems too, with West Indian pace bowler Fidel Edwards (hamstring) and South African batsman Rilee Rossouw (finger) sidelined. However, they have one of the division’s gun players in the form of South African pace bowler Kyle Abbott. Just as Yorkshire pace bowler Ben Coad has blazed a trail with 18 wickets in the first two matches, so Abbott has been similarly prolific. The 29-year-old has captured 16 wickets – including seven in the second innings at Headingley, and nine in the match. “Hampshire have recruited really well, especially with Kyle Abbott,” said Gale. “I think he’s a fantastic addition to their side. “I’ve said from the outset that any team in this division can win the title, and Hampshire showed what they can do when they played against us. Coad, 23, echoed Gale’s assessment of this week’s opponents. The pace bowler, who is currently the leading wicket-taker in Division One, said: “They (Hampshire) finished in the bottom two last year, so they have been a bit of a surprise. “But they have made some very good signings in Rilee Rossouw and Kyle Abbott, who are both very good players. Coad captured 6-37 and 2-96 in the match against Hampshire at Leeds. He followed that up with 5-52 and 5-50 at Warwickshire. “As long as I bowl like I did when Hampshire came to Headingley, then I’ll be alright,” said Coad, who this week signed a one-year contract extension that will keep him at the club until at least the end of next year. “I just have to keep performing the way that I have. “In both games so far, we’ve played some really good cricket as a team and have managed to step it up each time. Yorkshire are unbeaten on their last six trips to the Ageas Bowl, winning twice and drawing four times. In fact, they have only tasted defeat three times in their last 45 Championship away games. During that spell they have won 16 and drawn 26. It is one of many statistical legacies from the Jason Gillespie coaching era, and a record that Yorkshire have built on immediately with their win at Edgbaston under new coach Gale. Another victory on the south coast would confirm the belief that Gale’s side have an excellent chance of mounting a powerful title challenge.